You can import Business Cards or Tags, that you create in Sansan to categorized business cards, into Arm Treasure Data. You can also import Business Cards with attached Tag Names. Login to Sansan then go to Settings. From Settings page click API Key on menu and copy API Key value. Go to Treasure Data Connections and search and select Sansan. Click Create. The following dialog opens. Edit the required credentials. Input your Sansan API Key that you copied in the previous step. Name your new Sansan Connection. Click Done. The dialog opens. Complete the details as follows. Specify the Sansan data type that you want to import: Business Card or Tag. Import a set of business cards based on: Select Term or Condition. Select Term to import cards updated within a specified timeframe. Select Condition to import cards based on specified Tag Names. Include previous business card information: Include past business cards. Check this box if you want business cards, that are recognized as for the same person, to be imported as separate cards. Filter by range of holder: The range of business cards can be specified as “me” (only the cards held by oneself) or as “all” (all the cards within the range that can be viewed by oneself). Complete the following fields if you want to import Business Card based on Sansan defined Terms. Terms are a timeframe, a range of time that the business cards are created or updated in Sansan. Data Card Updated From: Import business cards updated since this time. Time is set in . UTC. Data Card Updated To: Import business cards updated until this time. Time is set in UTC. Incremental: When importing based on a schedule, the time window of the fetched data automatically shifts forward on each run. For example, if the initial config is January 1, with ten days in duration, the first run fetches data modified from January 1 to January 10, the second run fetches from January 11 to January 20, and so on. Complete the following fields if you want to import Business Card based on Sansan defined Conditions. Filter by Tag: Import business cards contain a Tag. Select this if you want to import by Tag. If you select you must specify a Tag name. Leave the box unchecked if you don't want to match business cards by tags. Tag Name: Import business cards that have the attached tag name specified. Enter only one name. Example: If you enter 'Treasure_Data', all business cards that contain the Treasure_Data tag name are imported. Tag range: Specify the range of Tag holders. Import business card that have an attached tag within the range of Me or All. You can specify to import only Sansan tags, not business cards. Import Tag data into Treasure Data to better manage the tags and align information. After completing your configuration, click Next. You’ll see a preview of your data. To make changes, click Advanced Settings otherwise, click Next. Page size. 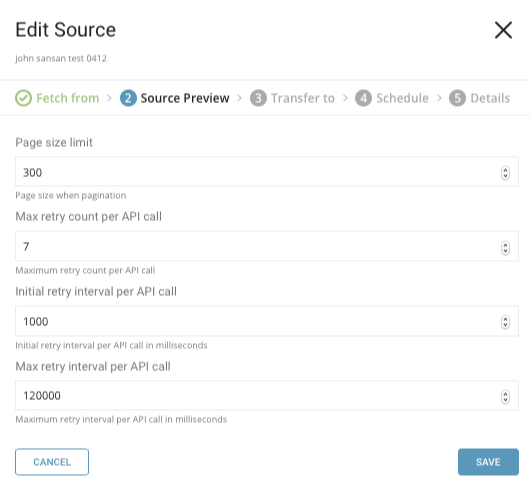 Determines the number of records will be returned for each call to the Sansan REST API. Maximum retry times. Specifies the maximum retry times for each API call. Initial retry interval millisecond. Specifies the wait time for first retry. Maximum retry interval milliseconds. Specifies the maximum time between retries. In the When tab, you can specify one-time transfer, or schedule an automated recurring transfer. Name your Transfer and click Done to start. The configuration file includes an in: section where you specify what comes into the connector from Sansan and an out: section where you specify what the connector puts out to the database in Treasure Data. For more details on available out modes, see the Appendix. The following example shows how to specify import of Business Cards based on a specified Term, without incremental scheduling. The following example shows how to specify import of Business Cards based on a specified Term, with incremental scheduling. The following example shows how to specify import of Business Cards based on a specified Condition without a Tag filter. The following example shows how to specify import of Business Cards based on a specified Condition with a Tag filter. The following example shows how to specify import of Tags only. You use td connector:issue to execute the job. It is recommended to specify --time-column option, because Treasure Data’s storage is partitioned by time. If the option is not given, the data connector selects the first long or timestamp column as the partitioning time. The type of the column, specified by --time-column, must be either of long or timestamp type (use Preview results to check for the available column name and type. Generally, most data types have a last_modified_date column). td connector:issue assumes you have already created a database (sample_db) and a table (sample_table). If the database or the table do not exist in TD, td connector:issue will fail. Therefore you must create the database and table manually or use --auto-create-table with td connector:issue to automatically create the database and table. Finally, from the command line, submit the load job. Processing might take a couple of hours depending on the data size. You can schedule periodic data connector execution for periodic Sansan import. We configure our scheduler carefully in order to achieve high availability. By using this feature, you no longer need a cron daemon on your local data center. incremental This configuration is used to control the load mode, which governs how the data connector fetches data from<integration> based on one of the native timestamp fields associated with each object. columns This configuration is used to define a custom schema for data to be imported into Treasure Data. You can define only columns that you are interested in here but make sure they exist in the object that you are fetching. Otherwise, these columns aren’t available in the result. last_record This configuration is used to control the last record from the previous load job. It requires the object include a key for the column name and a value for the column’s value. The key needs to match the Sansan column name. See Appendix: How Incremental Loading works for details and examples. The `cron` parameter accepts these options: `@hourly`, `@daily` and `@monthly`. It’s also recommended to specify the --time-column option, since Treasure Data’s storage is partitioned by time. You can see the list of currently scheduled entries by entering the command td connector:list. You can specify file import mode in the out section of the load.yml file. The out section controls how data is imported into a Treasure Data table. For example, you may choose to append data or replace data in an existing table in Treasure Data. Output modes are ways to modify the data as the data is placed in Treasure Data. Append (default): Records are appended to the target table. Replace (available In td 0.11.10 and later): Replaces data in the target table. Any manual schema changes made to the target table remain intact. Incremental loading uses monotonically increasing unique columns (such as AUTO_INCREMENT column) to load records which were inserted (or updated) after last execution. When bulk data loading finishes successfully, it outputs last_record: parameter as config-diff so that next execution uses it. Then, it updates last_record: so that next execution uses the updated last_record. Recommended usage is to leave incremental_columns unset and let the connector automatically finds an AUTO_INCREMENT primary key. Currently, only Timestamp, Datetime and numerical columns are supported as incremental_columns. For the raw query, the incremental_columns is required because it won't be able to detect the Primary keys for a complex query. If incremental: false is set,the data connector fetches all the records of the specified <integration> object type, regardless of when they were last updated. This mode is best combined with writing data into a destination table using ‘replace’ mode.